St. Joseph's Academy | Congratulations to JoeBotics! 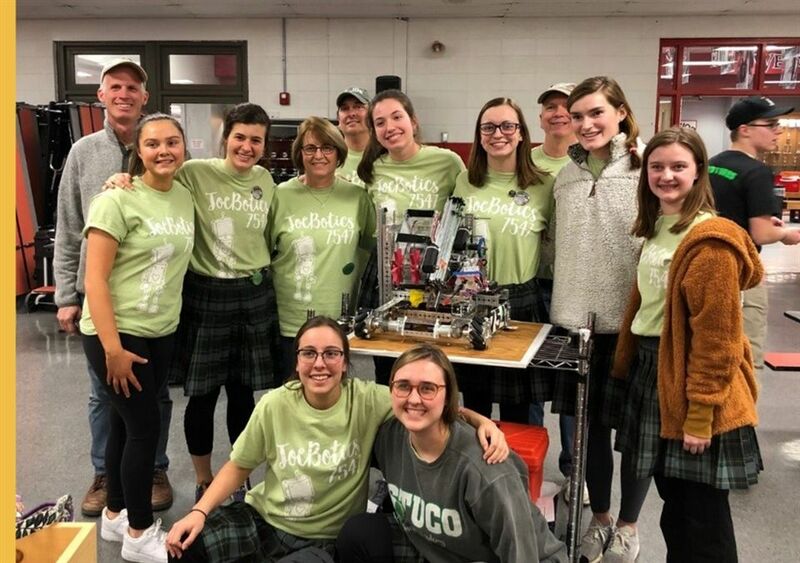 At the FIRST Tech Challenge Missouri East Qualifier, the Joebotics Team was part of exciting, nail-biting, finals matches. They were part of the winning alliance team, which sends them to the state championship tournament in Rolla! The team also received the recognition of the “Control Award”. This award is based on innovative thinking in the control system programming to solve game challenges, including autonomous operations. Congratulations to our state qualifying team: Katie Augsburger, Kate Broun, Kelly Dean, Sydney Hilker, Katie Horan, Kelsey Kimes, Katie Kostecki, Marissa Ledbetter, Mags Maloney, Bonnie Peccola, Marie Rebello, Sarah Stewart, Kristin Strout, Madison Weishaar, and Katie Young. The team did a wonderful job! Many thanks to the team mentors Mr. Alfred Strout, Mr. Mike Goodrow, Mr. Bill Broun and the team coach, Mrs. Julie Haddock.